Open letter from the President. On behalf of the CW executive, I am pleased to announce that online registration for the 2018/2019 season is now available. This year CW executive put considerable thought and consideration into the final registration fees. We are determined to ensure the game of rugby continues to be as accessible as possible while the clubs operations face significant cost increases in virtually every area. Bus, ferry, equipment and hosting costs are just a few examples of costs that continue to increase on a yearly basis. We have grown significantly as a club adding new programs which is something we want to continue but comes with added cost pressures. These realities along with the Rugby Canada decision to increase their per player fee for all players 12 years of age and older means CW is faced with a need to pass on some of this cost to players and parents. It is important players and parents to understand the amount collected by CW includes Rugby Canada, BC Rugby fees, not just our club dues. Keeping fees at the levels there currently are at is heavily offset by our fundraising efforts and the ongoing commitment of our sponsors who have been incredibly loyal over the past several years. CW has always made fee decisions based on the principle of keeping the costs for players and families as affordable as possible. Over the next year executive will be focussed on areas of growth (ie: rugby sevens, adding another girls age grade level and eventually a second women’s side) and revenues (ie: more fundraising activities and identifying new sponsors). We hope these efforts can ensure any further increases are as minimal as possible while at the same time the club grows and evolves with the game itself. To all the returning players, parents, volunteers and supporters - thank you and welcome back! To those considering joining the club - I look forward to welcoming you into the CW family very soon. Every rugby player in B.C. needs to be registered electronically with the Rugby Canada National Online Registration System. CW believes the fees charged for our programs are very reasonable compared with other community sports programs. The bulk of registration is taken up by insurance costs. The following steps are provided as guidance for using the registration system. 1. After launching to this above page, select "British Columbia", then scroll and select "Castaway Wanderers". 2. Choose a registration category, scroll down and hit the "REGISTER" button. 3. Because this is a new registration system, everyone has to start with "Create Account". 4. Dues/insurance will be detailed as you proceed through the next steps and after acceptance of the waiver, you will be presented with payment options. Please note the network access / service fee is $2 per Interac transaction and 3.25% of the fee for credit cards. Completion results in a printed invoice will be e-mailed to you and you will have the ability to print the Rugby Canada registration form. Details on the Rugby Canada and BCRU dues, please see this link. Fee breakdown goes to Rugby Canada for insurance; BCRU team fees; Registration system fees and club dues. Club dues cover operating expenses such as field rentals, coach insurance, hosting, Jamboree costs and miscellaneous, such as "weekly goodies". Every player will receive a club tee shirt with registration and girls and boys U12 and younger will receieve a mouth-guard. Fee breakdown goes to Rugby Canada insurance; BCRU team dues; Registration system fees and club dues. Club dues include; operating expenses such as uniforms, kit, field rental, coaching, medical supplies, hosting, referee fees and other club costs. The registration fees cover basic insurance for all players involved. Details of this insurance can be found here. Additional insurance coverage can be purchased through Rugby Canada. 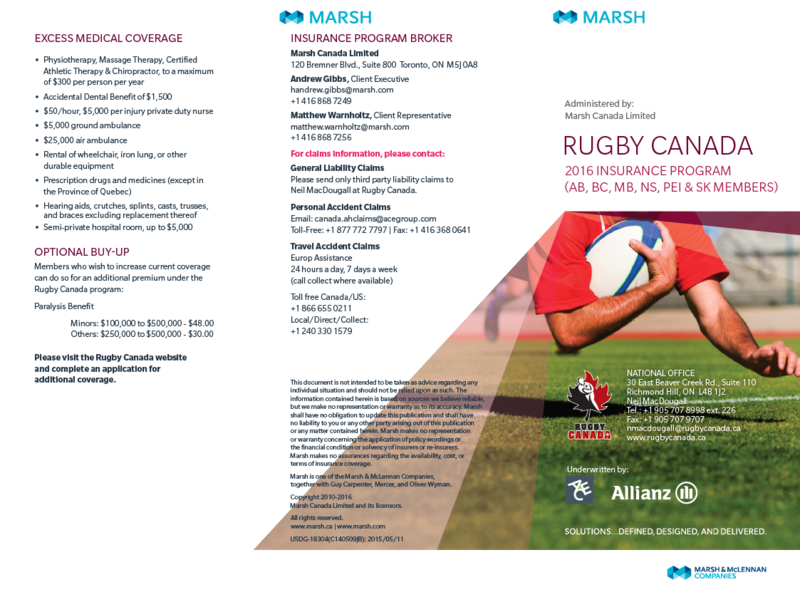 For further insurance questions please contact the Rugby Canada directly. Refund Policy – Refund requests are assessed on a case-by-case basis and require approval by the Board of Directors before being issued. Services and Merchandise – Castaway Wanderers Rugby Football Club provides registration services and collection of dues for its players and members.